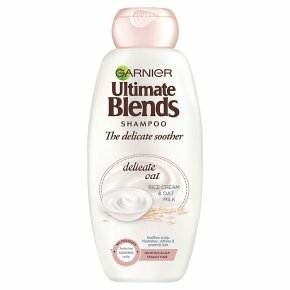 How to Apply Garnier Ultimate Blends Delicate Oat Shampoo: Massage into wet hair. Lather, rinse & follow with our Delicate Oat Sensitive Scalp Conditioner. For intense care, indulge in our Delicate Oat Hair Treatment. Finish with our multi-tasking Heat Protection Milk to help protect hair whilst styling.